MOVIE REVIEWS: Winnie the Pooh (Stephen A. Johnson and Don Hall, 2011) | Bro. B.I.B. Here we have it, the last American hand-drawn animated film made to date…to my knowledge. I certainly hope this isn’t the last traditionally animated film that’s ever made; if it is, though, it certainly is a nice and sort of nostalgic film to end on! I think Winnie the Pooh is one of those characters that brings people back to a certain age: an innocent, pleasant, and comforting state in their lives. I sure do wish I could relate to that. That’s not to say I don’t know how it feels to be taken back to that period of my life, but Winnie the Pooh doesn’t take me there. I didn’t grow up with this character or his friends. I never read the books, I never saw the shows, and I’ve never seen the movies. I, of course, knew who the character was and would occasionally see a video of his, but I didn’t grow up with him. 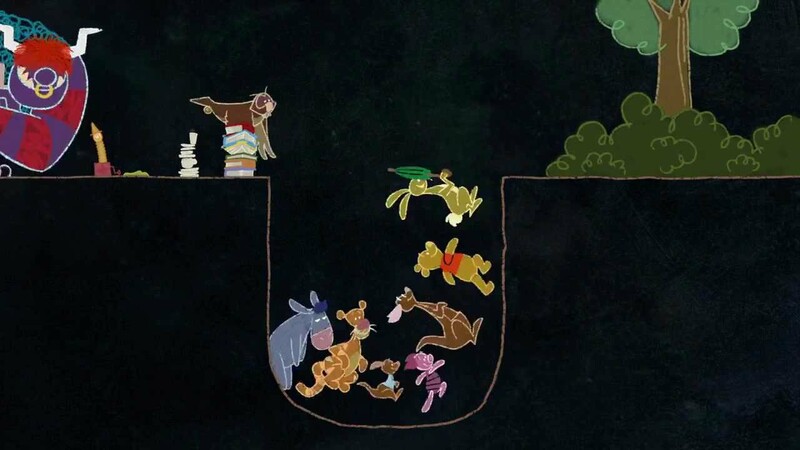 Therefore, I won’t be drawing too many distinctions between other Winnie the Pooh stories and this film. That being said, let’s go ahead and review this wonderful movie. ANIMATION: The animation is really good in this movie. The look of this film matches the spirit of Pooh and the world he lives in perfectly: it’s very innocent. You see that in the inside cover of the book at the beginning of the film. I like that the backgrounds are kind of sketchy; that’s a very nice return to the original Pooh film and some of the Disney films around that time as well. Everything, for the most part, looks like it’s hand-drawn, too. Everything in the background (I may even say most things) looks traditional and not CG. That’s very nice, and very rare these days. Everything looks so innocent and childlike, I can’t help but smile as I watch this movie! I also like how the animation style changes during “The Backson Song.” I’ll say it again: if there aren’t anymore American cinematic films in the style of traditional animation, I’ll be very glad to know that this wonderful looking movie was the last one. Well done, movie. Well done. SONGS/MUSIC: The songs in this film are a heck of a lot of fun! They’re just so happy, cheery, fun, and, again, innocent! They certainly do keep me smiling throughout the movie. The songwriters and composer have a difficult task here. In addition to writing music and songs that help accompany the characters and the story (which is hard enough), they also have to embody the spirit of a world and character that are already well known. That’s not easy, but these people do a marvelous job! The film’s composer is Henry Jackman, and the songwriters are Kristen Anderson-Lopez and Robert Lopez. A lot of people already know these two would go on to write the songs for another hit movie. I’m not going to spoil it here for those who don’t know already. Let’s just say the review to that film is coming soon. But enough talk – let’s talk about these songs! 1) Winnie the Pooh: There is no way you heard this song in the theater or wherever, and didn’t experience some kind of joy or happiness! Even people who haven’t seen The Many Adventures of Winnie the Pooh (John Lounsbery and Wolfgang Reitherman, 1977), like me, know this song! This number was written by Robert B. Sherman and Richard M. Sherman, and it embodies everything you want in a Winnie the Pooh story or movie. It’s whimsical. It’s fun. It’s charming. It’s cute. It’s innocent. What else can you say – it’s Winnie the Pooh! Even this pop version is great, and I don’t normally like pop versions of classic songs! This one is still nice, innocent, and respectful of the original! Way to go, Zooey Deschanel and M. Ward! Thank you for keeping it classy! 2) The Tummy Song: What can you say? It’s Pooh singing about one of the most important things in the world to him. It’s a very nice song…Yeah! 3) A Very Important Thing to Do: I love that I can bop my head to this song. I love that it’s short and sweet. I love the bouncy music. This does sound like something the Sherman brothers would have written. It’s great! 4) The Winner Song: It’s nice. The lyrics are funny. 5) The Backson Song: I love this song! The lyrics are wonderful, the music is a ton of fun, and it’s just fun to hear what these characters think a backson is and does. Also, it moves the story along…Blah, blah, blah, I don’t care. So long as I get an innocent and fun song in a Winnie the Pooh movie that’s done right, that’s all I care about! Wonderful job, songwriters! 7) Everything is Honey: This is as close to a perfect Winnie the Pooh song as a song can get, besides the “Winnie the Pooh” number. I love that it opens with a heavenly and angelic intro, and then moves into a campy, upbeat tune. It is one of the happiest songs I’ve heard in a while. I wish I could write a song so delightful for something I love so much! This song is sweet! 8) So Long: I do like this song OK, but…I don’t get why it’s in this movie. What does it have to do with Winnie the Pooh? What’s the purpose of having it here? Did we just need a fun pop song at the end – any fun pop song? Is it because Pooh has great friends? 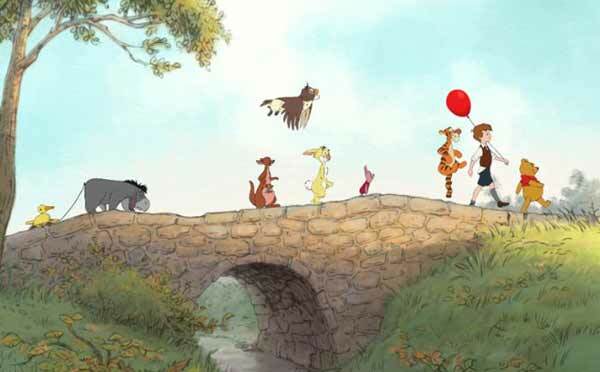 Is it a song that speaks for Christopher Robin since these characters are his imaginary friends? What’s the purpose of it being here in the film? It’s the song that captures the spirit of Winnie the Pooh the least…at least out of all the songs in this film. I just don’t get the music style, the lyrics, or the tone. It’s a fine song on it’s own, but I don’t think it represents Winnie the Pooh that well. ROMANCE: Oh…We could’ve skipped right over this section, huh? 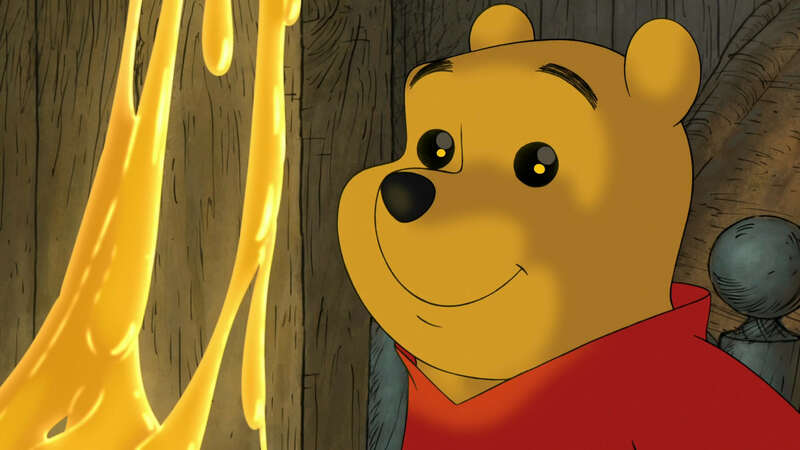 Well…Pooh is in love with honey. Does that count? CHARACTERS: I’m going to cheat here a little and not talk about each of the characters individually. What would be the point of that? We all know these characters, and we all love them! Pooh himself is one of the most loveable and huggable characters in the world; I don’t know a single person who would be so cruel to say they hate Pooh! Yes he’s kind and caring, but he’s also naïve and very innocent. He has a childlike personality to him – a young child, a preschool kid. 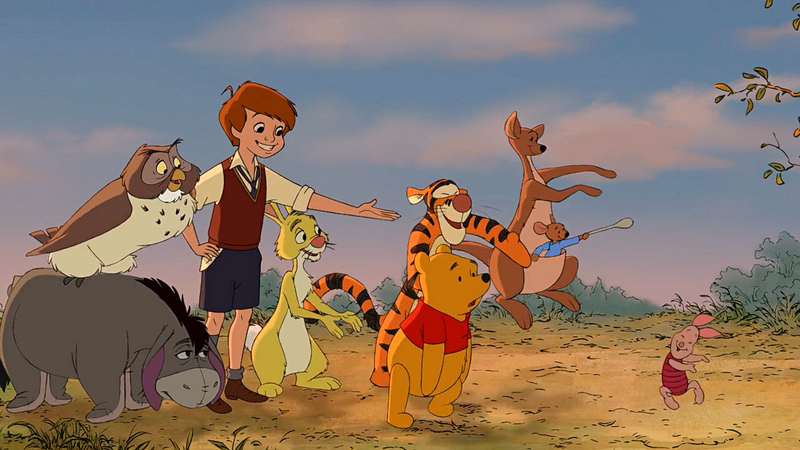 Tigger is bouncy (literally and figuratively), Rabbit is hard tempered, Piglet is cute and adorable (done right), Christopher Robin is kind and smart, Kanga and Roo make an awesome pair, Owl is a smart airhead, and Eeyore needs a hug! GOODNESS GRACIOUS! Why is he so sad? What is it going to take for this donkey to smile and be happy? What made him so sad to begin with? Eeyore, I’m so sorry! I’m here for you, man! I’ll also say this: the voice actors are amazing! Again, they have the responsibility of embodying the spirit of characters we already know and love – characters that date back to before many of us were born! They all did a wonderful job! STORY AND THEMES & MESSAGES: The story is pretty basic and straight forward. Pooh wants honey. Eeyore loses his tale. The characters try to save Christopher Robin from the backson. These are the stories that take place in this film. I like that they are connected, but they’re too spaced out from each other. 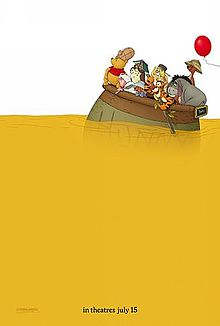 Of course Pooh’s chasing honey the entire film, but the story with Eeyore stops in the middle of the film to focus on the story with the backson. 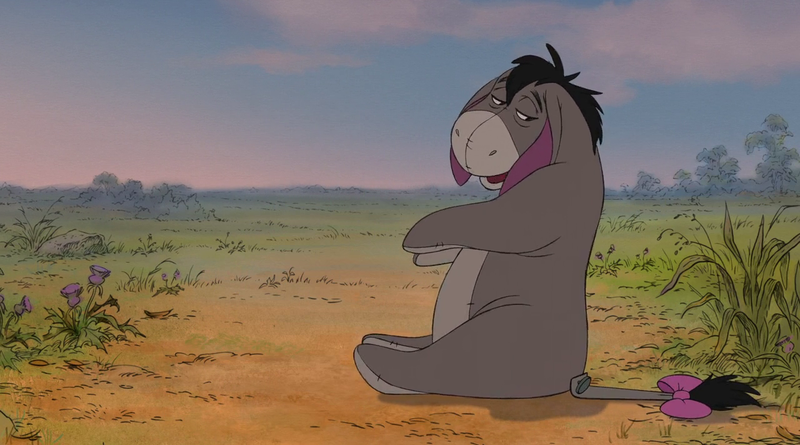 After that story ends, near the end of the film, the movie finishes with the conclusion of Eeyore’s story. Why did we need to stop the first story? We’re reminded of it a couple of times during the other story, but for the most part it just stops. Other than that, the story is fine. This film is also very funny. I was surprised by how many funny jokes were in this film. The stories aren’t hard to follow, and they fit the spirit of our characters. The message is pretty straight forward. Pooh has to learn to put others’ needs before his own wants. It’s a good lesson, and it’s conveyed in a nice way. CONCLUSION: I know this review wasn’t as analytical as much as it was redundant, but how many times can you say something is good? The movie is just such a good movie! It’s wonderful! Even though I didn’t grow up with Winnie the Pooh and his friends and adventures, but this movie does take me back to being a little kid again! The characters are so innocent. Their adventures are so innocent. The songs are so innocent. The jokes are so innocent. The animation is so innocent. I love that for as innocent as this film is, it’s not pandering! It’s not patronizing adults or children! It’s just the world of these characters. The movie is as good as it is innocent – the goodness of the film lies in how innocent it is. I’m so glad I finally saw this film! It took me back to my youthful place of innocence, and I always love going to that place! I love this wonderful movie!